In previous posts, we’ve shared the King Hiram Royal Arch Chapter mark book, one of the treasures of our archives collection, and our discovery of its artist. The excitement around this book continues as the National Heritage Museum announces the recent acquisition of a silver Masonic mark medal originally owned by one of the members of King Hiram Chapter! Mark medals were often made to order for men who received the Mark Master degree, part of the York Rite, a Masonic organization through which a Freemason may pursue additional degrees. The degree is named after the marks that stonemasons chiseled into the stones of buildings to identify their work. Like medieval stonemasons, Masonic Mark Masters create their own symbol, which they register in their chapter’s Mark Book. Originally owned by Ezekiel Bascom (1777-1841), this medal was made in Massachusetts around 1816. Ezekiel Lysander Bascom was born in Deerfield, Massachusetts in 1777 and pursued a vocation as a Congregationalist minister. In 1806, he married Ruth Henshaw (1772-1848), who is known today for her prolific work as a rural artist. Ruth Henshaw Bascom drew profile portraits in pencil, pastel and watercolor (follow this link to see an example of her work). Ezekiel joined Boston’s St. Andrew’s Royal Arch Chapter in 1806. Ten years later, in 1816, when King Hiram Chapter was formed in Greenwich, Massachusetts (much closer to his home than Boston), Bascom became its initial High Priest, or leader. The design on the mark medal closely resembles the depiction of Bascom’s mark in the Chapter’s mark book (as you can see in the photo below). The medal was purchased with the assistance of the Kane Lodge Foundation and the Cogswell Beneficial Trust. The National Heritage Museum deeply appreciates their support. Masonic Mark Medal (front and back), 1816, probably Boston, Massachusetts, National Heritage Museum, acquired through the generosity of the Kane Lodge Foundation, Cogswell Beneficial Trust and William W. Lewis, 2009.031. Mark of Ezekiel Bascom, King Hiram Royal Arch Chapter Mark Book, 1825-1838, Martha S. Harding (1813-1841), New Salem, Massachusetts, Van Gorden-Williams Library & Archives, National Heritage Museum, Museum purchase, A92/001/1. Exciting Discovery - Artist of Mark Book Identified! One of the staff’s favorite objects in the Van Gorden-Williams Library & Archives collection at the National Heritage Museum is the mark book for King Hiram Royal Arch Chapter (see Archivist Catherine Swanson’s previous post about the book). For several years, we theorized that the artist of the book, an “M.S. Harding” who signed several pages, might be a young woman. 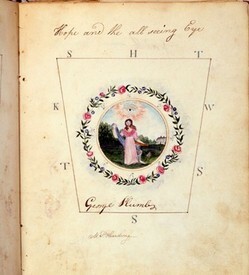 The technique exemplified in the drawings and the use of watercolors to create them suggest the kind of work taught in numerous New England academies for young ladies during the early 1800s (see an image of one page on the left). New research has led to the exciting discovery that “M.S. Harding” was indeed a young woman, Martha S. Harding of New Salem, Massachusetts. Born in 1813, Martha was the daughter of Alpheus Harding (1780-1869) and Sarah Bridge (b. circa 1788). Her father belonged to King Hiram Royal Arch Chapter, which was established in nearby Greenwich, Massachusetts in 1815. Massachusetts history buffs will recognize Greenwich as one of the towns submerged in the 1930s to create the Quabbin Reservoir. Alpheus Harding, the pastor of New Salem Congregational Church, chose a mark that reflects his vocation. It shows a lamb holding a Christian cross. Two other pages from the book are shown here; the one on the right depicts the mark chosen by Thomas Thwing and shows Martha’s signature at the bottom. Alpheus also served as a preceptor at New Salem Academy. School records show that his children - including Martha, who was a pupil from 1822 to 1829 - attended. It is possible that she learned to draw and paint while at the Academy, perhaps even making the mark book while she was a student. When she was 25, in 1838, Martha married Asarelah M. Bridge (1810-1865), who was a student at New Salem Academy in 1830. Sadly, Martha contracted consumption soon after her marriage and died in 1841 at the young age of 27. But her drawings live on in the King Hiram Chapter mark book, allowing us to admire her artistic skill and teaching us that the families of 19th-century Freemasons were familiar with the symbols and values of the fraternity. Left: Mark of William K. Talbot, King Hiram Royal Arch Chapter Mark Book, 1825-1838, Martha S. Harding (1813-1841), New Salem, Massachusetts, Van Gorden-Williams Library & Archives, National Heritage Museum, Museum purchase, A92/001/1, photograph by David Bohl. Right: Mark of Thomas Thwing, King Hiram Royal Arch Chapter Mark Book, 1825-1838, Martha S. Harding (1813-1841), New Salem, Massachusetts, Van Gorden-Williams Library & Archives, National Heritage Museum, Museum purchase, A92/001/1, photograph by David Bohl. The exhibition Remember Me at the National Heritage Museum contains many documents and books from the VGW Library and Archives. One of these pieces is a Mark Book (MA 001.003), or registration records of King Hiram Royal Arch Chapter, Greenwich Village, Massachusetts dated 1815-1835. Each mark or symbol is in the outline of a keystone which is the symbol associated with the Mark Master degree, the 4th degree in York Rite Freemasonry. The circle in the center of each keystone is filled with a symbol, or Mark, chosen by a Mark Mason upon his initiation. The designs, or symbols, were then drawn and the owner signed his name to it. Chosen marks could never be changed. The symbol did not have to be Masonic in nature. Often the initiates chose an image associated with his profession or trade or family coat of arms. The tradition of speculative Masons having unique marks goes back to the stone masons of the Middle Ages. Each stone mason, or operative mason, had a mark that they put on each stone that they shaped. This helped assuring quality and craftsmanship. Many Gothic cathedrals are filled with stone masons' marks. The early 18th-century Masons in Great Britain and American modeled many of their traditions after these stone masons. George Plumb, whose mark is seen here, chose symbols that were definitely Masonic in nature. Inside the circle is a woman supporting an anchor, which for Masons symbolizes Hope. Above the woman is the all-seeing eye which for Masons symbolizes watchfulness and the Supreme Being. Below the keystone is the signature of the illustrator, M. S. Harding.